Corrugated metal roofing sheets bring together high quality steel and a corrugated design to provide incredible strength. This makes them ideal for agricultural buildings, such as barns and stables. They are also lightweight when compared to many other roofing systems and therefore suitable for domestic projects. This includes garage roof replacements, shed roof construction and more. Roofing Megastore stock corrugated steel roofing sheets in various thicknesses and lengths. This allows you to maximise coverage whilst minimising wastage. Many of our sheets feature a 8/3 profile with seperate box profile sheets also being available. You'll also find a selection of plastic coated steel roofing sheets when shopping at Roofing Megastore. These utilise either PVC or polyester coating to extend the life expectancy of these sheets further. Due to the use of high quality steel and optional plastic coatings, these sheets are likely to last for decades. They are also virtually maintenance free. This makes our range of corrugated metal roofing sheets ideal for horse owners and live stock owners with little time on their hands. They are also perfect for those looking to cover valuable goods in a barn or garage. Have Questions About Our Corrugated Metal Roofing Sheets? If you have questions about our range of corrugated steel roofing, speak to our team by telephone or via the online chat. With over 40 years of experience in roofing, we'll help answer your questions about corrugated metal roofing sheets. We will also help you pick the necessary fixings and flashings for your project. By combining high quality steel and a corrugated form factor, our range of metal roofing sheets are a superb solution for virtually any roofing project. 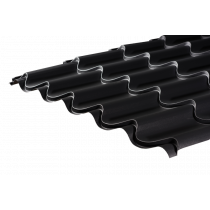 All the while these roofing sheets are easy to fit and lightweight, especially when compared to traditional roof tiles. There are, however, a few common questions our customers ask before buying these roofing sheets. Below are answers to each of these! Why Use Corrugated Metal Roofing Sheets? These corrugated sheets are among the strongest materials available to DIYers. This is as the combination of a corrugated form factor and high quality steel provides superb strength when compared to other profiles. Our optional coatings extend their durability further, with both a PVC and polyester coating available. This ensures your roof is able to withstand tough weather conditions, such as strong wind and severe rain. Where Can I Use These Corrugated Sheets? These metal roofing sheets can be used on a variety of roofing projects. They are particularly popular amongst those looking to reroof an agricultural building, such as a stable or bale storage. These sheets are also used on domestic projects, such as small garden sheds and larger garages. The possibilities truly are engless! Can These Roofing Sheets Be Cut to Size? We do not cut these steel roofing sheets to size. However, they are available in an variety of convenient sizes when you order online. These metal corrugated roofing sheets can also be easily cut on site without the need for specialist equipment. This means you can maximise coverage and minimise wastage on your project. Will These Corrugated Metal Roofing Sheets Rust? Through the combination of steel and innovative materials such as zinc, these corrugated metal roofing sheets minimise the likelihood of rust forming. Our optional coatings also provide added protection from the elements, with our PVC coating extending the lifespan of your roofing sheet by up to 10 years. They really do offer uncomrpomised durability! If you have more questions about our corrugated steel roofing sheets, speak to our team online or by telephone. With over 40 years of experience in roofing, we'll help answer your questions and will ensure you have everything you'll need to complete your roofing project.